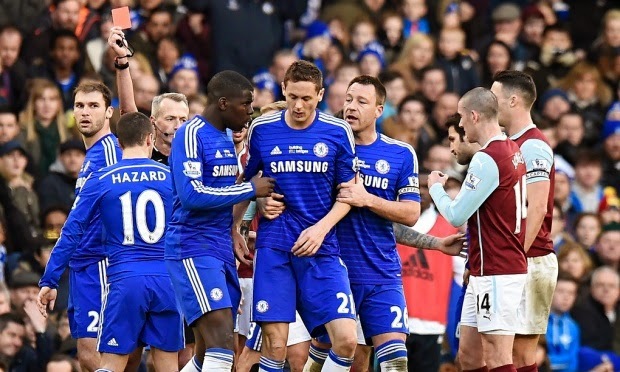 Chelsea are to appeal the red card shown to Nemanja Matic during the Blues’ 1-1 draw with Burnley on Saturday. Matic was sent off after reacting angrily to a challenge from Ashley Barnes and pushing his opponent to the ground. A straight red card carries an automatic three-match suspension, which would rule Matic out of the Capital One Cup final against Tottenham as well as the Premier League matches with West Ham and Southampton. Chelsea have until 1pm on Tuesday to lodge an appeal, but the club have already declared their intention to fight the decision in the hope of having Matic available for Sunday’s Wembley showdown against Tottenham.